And that's the starting point for a fast-paced salsa dance that goes way beyond tomatoes. 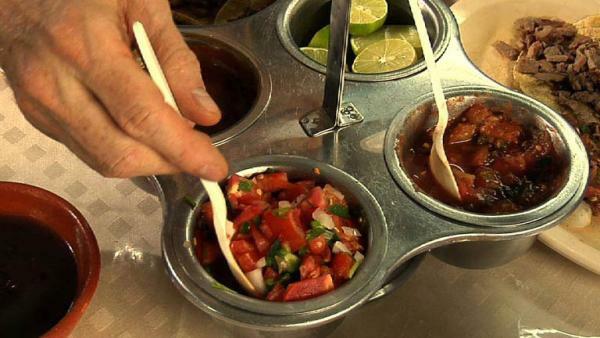 In Mexico, salsas can be bright and fresh, dark and earthy, red or green, raw or roasted -- and they're more of a condiment for food than a dip for chips. At Los Parados, a favorite Mexico City taquería, Rick and Lanie show us the three pillars of Mexican salsa: that familiar fresh-tomato salsa Mexicana, salsa de molcajete made from roasted tomato, chile and garlic pounded in a lava-stone mortar, and red chile salsa, made by toasting, soaking and grinding dried chile de árbol. But that's just the beginning. At Manolo, another popular taquería, they discover a rich, spicy, peanut salsa and a classic, creamy avocado-tomatillo salsa. And while they've got avocados in mind, they head over to the Medellin Market, where chunky guacamole is served with slow-cooked pork carnitas. Inspired by all this, they decide to make a "salsa all-stars" dinner. It starts with a batch of Roasted Tomato Salsa, which they split in half. Rick turns his half into a Salsa with Olives and Dried Fruit to be served over grilled fish, while Lanie uses her half to flavor a Bayless family favorite, a Mexican-accented Mac and Cheese. Then they make an earthy Smoky Chipotle Salsa, which they again divide into two batches. One becomes the appetizer course, to be served with chips. The other half, Rick turns into a Manolo-style Chipotle Peanut Salsa to drizzle over grilled vegetables. It all comes together at an alfresco family dinner that proves a very Mexican point: beyond chipping and dipping, salsas can really cook! Rick Bayless makes a batch of roasted tomato salsa. Rick and his daughter, Lanie, decide to make a 'salsa all-stars' dinner. It starts with a batch of roasted tomato salsa, which they splits in half. Rick turns his half into a salsa with olives and dried fruit to be served over grilled fish, while Lanie uses her half to flavor a Bayless family favorite, a Mexican-accented mac and cheese. Rick makes a Manolo-style chipotle peanut salsa to drizzle over grilled vegetables.